Happy Holidays from James River! As we begin winter break, I want to wish everyone -- students, parents, teachers, staff, and friends of James River Day School -- a peaceful, happy holiday break. While the children are excited and eager for break to begin, we already look forward to 2019 with a sense of excitement and anticipation. Before we scatter to visit families, celebrate the upcoming holidays, or perhaps just relax at home, I wanted to celebrate a few special moments we’ve enjoyed in recent days. Last week, we all had to a chance to enjoy the third grade’s performance of The Lights of Jingle Bell Hill. Like many in the audiences, I laughed and smiled throughout the singing and acting, amazed by the coordination and teamwork demonstrated by the students’ performance. For those who couldn’t make the third show, you missed an amazing display of character, when a fourth grader stepped in to cover the role for an actor who had taken ill. Our brave young actor not only covered the lines of her friend but sang the most beautiful solo. I am brimming with pride and affection for our third grade performers and guest performer. Last night, we were treated to the Middle School winter concert onstage at the University of Lynchburg. 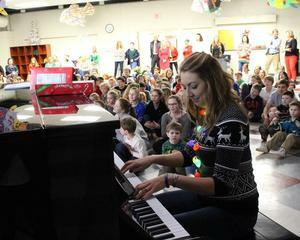 There are few things more lovely than listening to students sing and play instruments, mastering new skills and sharing the wonder of music with a live audience. It is no exaggeration to say that the James River music program is in a class by itself. Moments like the play or the concert don’t happen without the tireless commitment of talented teachers like Paddy Braunstein and Leigh Berkley. I marvel at their skill, patience, and vision, as they foster the love of music and performance in our children. These moments will indeed last a lifetime. I am honored to call them -- and the entire faculty, staff, and administration -- colleagues.